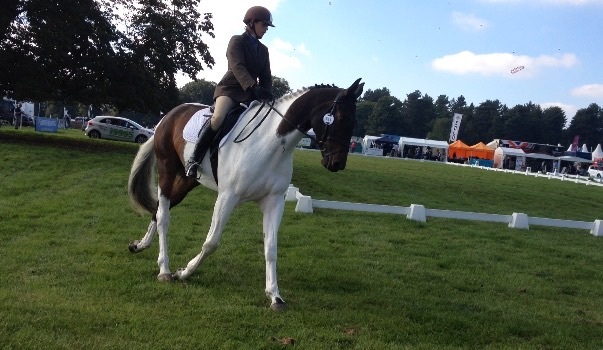 We have had a long and fabulous day at Osberton Young Horse Championships. We went with no high expectations as Massimo is still so green being so big at 17hh. He was a real star performing a mistake free calm dressage test, he doesn’t have flash paces but he put his best foot forward throughout the test. The test was in a long arena and in a Championship atmosphere, flowers, flags, trade stands and 2 judges. All brilliant experience for him. He had 3 poles SJ, which was a huge relief as he has only jumped at this height in competition twice before, during the last few weeks. XC he was lovely, bold and forward thinking, it felt easy to him and far too small. Several horses were eliminated and many faulted XC. When I walked the XC I thought it was the toughest I have seen here in the 4 year old champs. In the first 10 fences there was a proper ABC coffin which sloped down to a wide ditch, water, corner, step up to a skinny and also a house under trees with a hefty drop on the landing. Thanks to my volunteer groom for the day Tracy and to my lovely Ant for the picnic, his warming up advice and keeping me awake while I drove home.